In this guide, we will be covering all aspects of the Goblin unit, from stats and level upgrades to specific strategies for maximizing its effectiveness. The Goblin has low health, does above average damage, and is among the fastest units in the game with a speed of 32 (only Minions can move as quickly). As long as the Goblin does not stop to attack, it will easily outrun bombs and Mortar blasts. 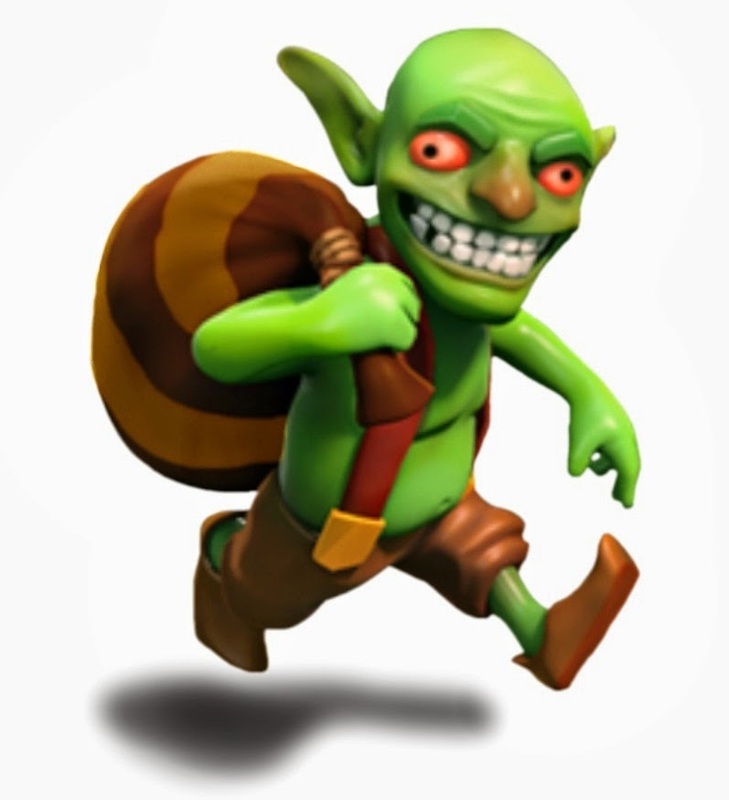 The Goblin is the only unit in Clash of Clans which specifically targets an enemy’s resources. The Goblin will go for the closest mine, collector, drill, or storage structure. It does not differentiate between these structures and will attack the one closest to where the Goblin is deployed. Since the Goblin already does high damage and deals double-damage to resources, it takes out these structures very quickly. Early in the game, I find the Goblin to be fairly weak. As it progresses in upgrades, it gains significant strength. The Goblin improves massively when upgraded from level 4 to 5 and from 5 to 6. Most units only get a small upgrade from levels 5 to 6, while the Goblin gets its best upgrade level during this range. Only the Balloon has a larger improvement when moving from level 5 to 6. In Clash of Clans, the Goblin is the only unit which is completely dedicated to farming. You will never use a Goblin for anything outside of farming, as Farming is simply what this unit was meant to do. While Goblins deal high damage and move fast, they do not make great offensive units simply because they will target resources first and typically die on their way to getting to said resources. Goblins dropped after all enemy resource points are destroyed are surprisingly strong, but this is not a practical use for this unit. There is really only one use for the Goblin: for farming. With that said, there are two types of farming that you can use the Goblin for: Elixir Collector and Gold Mine sniping or storage farming. The easiest way to use the Goblin is to farm an enemy’s Elixir Collectors, Gold Mines, and Dark Elixir Drills. The strategy really comes down to finding a good base and being patient. When farming, keep clicking next until you find a base with full Elixir Collectors or Dark Elixir Drills. Full Elixir Collectors are easy to spot because the elixir turns a very dark pink/purple color, whereas partially full Elixir Collectors have a bright pink color. Full Elixir Drills are a little harder to spot, but easy when you know what you are looking for – the box on top of the drill will be full and black when there is a good amount of Dark Elixir to steal. You may have to zoom in to see the little box on top of the Drill. I like looking for Elixir Collectors over Gold Mines, as Elixir Collectors are much easier to spot quickly. If Elixir Collectors are full, so too will be the Gold Mines. Once you find a base, just drop about 5-10 Goblins on each Gold Mine, Elixir Collector, and Drill. Collect your loot, end the battle, and move on to the next one. If you want to try and target Gold Storage, Elixir Storage, or Dark Elixir Storage structures, the Goblin is a good unit choice, but it requires much more strategy than just taking down mines or collectors. The primary issue is that Goblins do not have much health and will get easily killed by enemy Wizard Towers or Mortars when trying to get to the enemy’s storage units. As a result, you need to use a distracting unit (like Giants) as well as damage-dealing units (like Archers) to soak up fire and take down towers, respectively. Additionally, you will need Wall Breakers to take down walls to help the Goblins get access to the storage structures. Goblins can generally take down a wall or two if they are supported by a Healing Spell. Goblins’ damage is very high and they can tear down walls quickly, but when they are attacking walls, Goblins are vulnerable to Mortar fire or Wizard Tower hits. The Healing Spell will allow Goblins to take these hits, as long as several Mortar shots do not land at the same time. A full Dark Elixir Storage is usually well defended and at the center of an enemy’s base. You need to first take down part of the enemy’s base on the way to storage structure, coring a hole in the enemy’s base so your Goblins can get close. For lower tier bases, Giants, Wallbreakers, and Archers (Tier 7 or 8) can typically handle the job, but for higher tier bases (Tier 9), you may need to supplement the Giants with a few P.E.K.K.As and swap in Wizards for the Archers. Once you get within a wall or two’s reach of the Dark Elixir Storage and the Goblins will target the wall surrounding it, the storage is as good as yours. Make sure collectors on the perimeter of the base are not still up, so the Goblins are more likely to attack the wall surrounding the Dark Elixir. Once the wall is exposed, you can use a Rage Spell and a Healing Spell stacked on top of each other then quickly flood in with Goblins. Twenty Goblins under the effect of a rage spell will take down a level 8+ wall in just a few seconds. If you can flood in with 50, they will take it down in a second and then the storage in a second later. The Healing Spell and Rage Spell will help keep them alive and make sure they get the structure down. Goblins do not make a good Clan Castle unit and you will only irritate your Clan Members if you donate Goblins. While Goblins do solid damage and move quickly, they move so fast that they are so easy to lure out into the open and take down with Archers.